Lovely arrangement, beautiful flower, and I especially like the way the cuttings show off in the clear glass vase. Hi Judy. Thanks for the lovely comment. I don’t often use clear glass vases but was happy the roots provided something interesting to look at in this case. The philodendron is nice foliage for a flower that lack much of its own. Even if there were good leaves to cut, one would not want to deprive the bulb of limited foliage. Good point! I’d been eyeing that philodendron to use in a Monday vase, so glad the opportunity arose. Gorgeous! 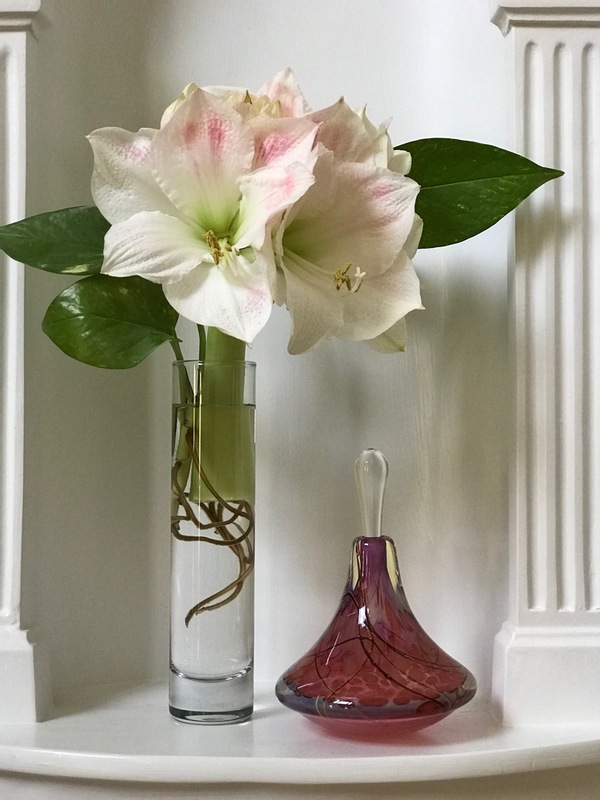 I was especially drawn to the movement of the philodendron roots which made this vase sing. The addition of the perfume bottle whose lines echo the roots is absolutely fabulous! What an eye you have. Thanks Peter, the roots were a lucky by-product of choosing the philodendron leaves, adding some extra zest. 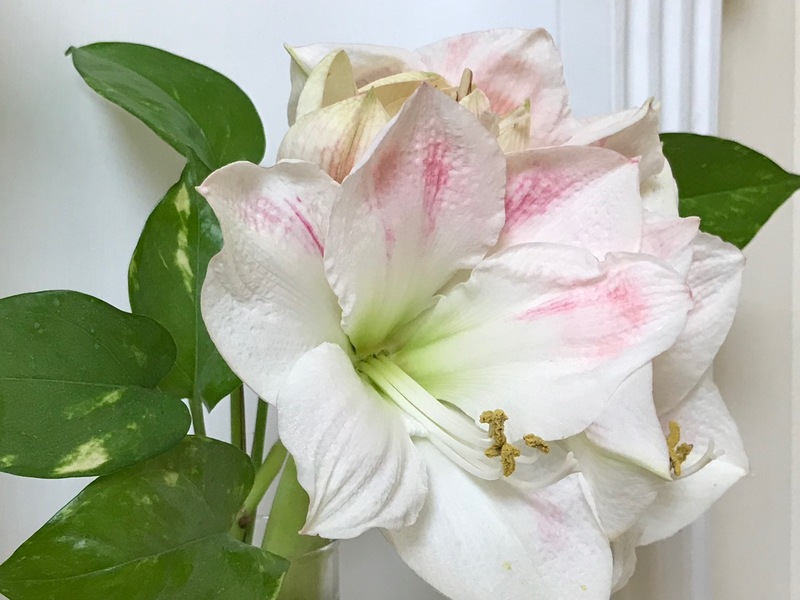 It has such beautiful colouring, I’m sure you’ll get many weeks of pleasure from that bulb and then perhaps you can persuade it to flower again next year. The perfume bottle is gorgeous and adds class. Thanks Alison. Amaryllis can actually grow outdoors here although I haven’t been able to keep them very many years. My sisters have some outside in their garden that were planted many years ago and which bloom beautifully each spring (maybe summer?). Thanks Cathy. 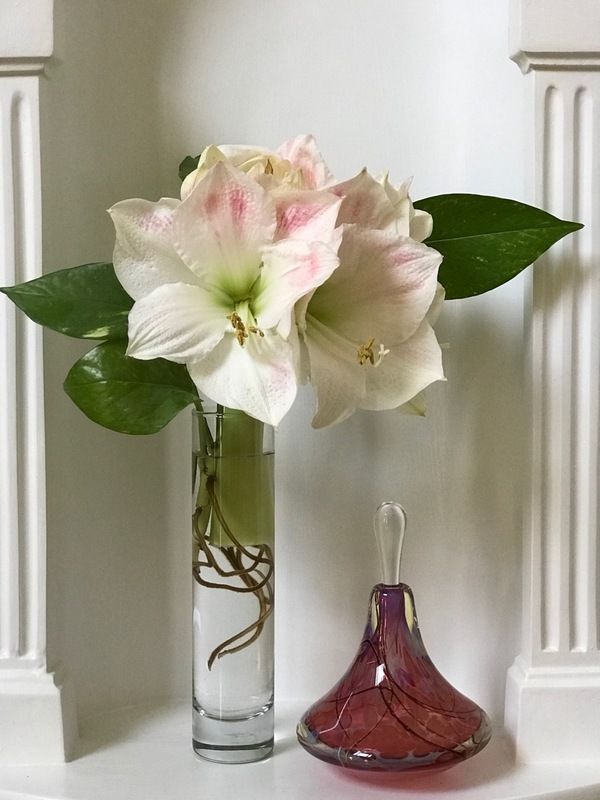 I’d tried a shorter bud vase since the stem was actually very short, but the flower was much too top-heavy. What a lovely gift and I love how you have placed it. Wish D a very happy birthday from us both. Thanks Christina. I’ll pass along your kind wishes! 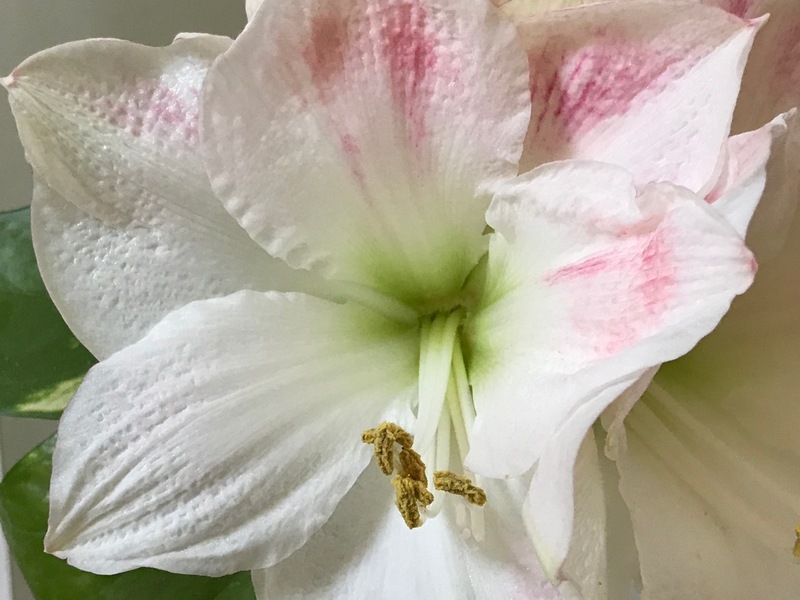 Like spun sugar, the crystalline petals of Hippeastrum captivate like no other! Your lovely perfume bottle complements elegantly. Thanks Eliza. Love your description of the petals! Simply beautiful, Susie! 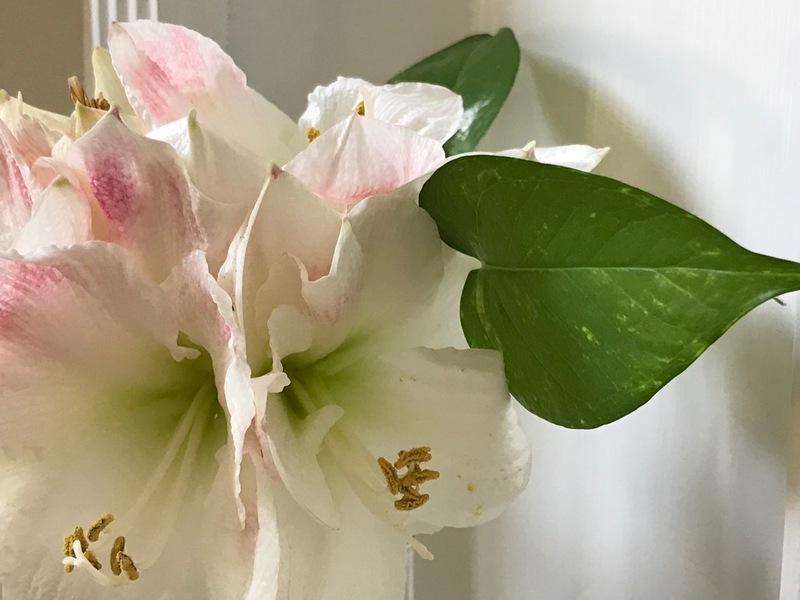 I was surprised to read that Hippeastrum flowers will last longer in a vase than attached to the plant. If (when!) any of mine bloom this year, I’ll keep that in mind and may cut them (for their own good). Can we trust what we read on the web Kris? I will try to let you know if it doesn’t work very well but I do see these flowers used frequently as cut flowers. The whole thing is beautiful and so nicely staged. I like the underwater part best (almost). Thanks Ricki, will have to give more thought to underwater arrangements! 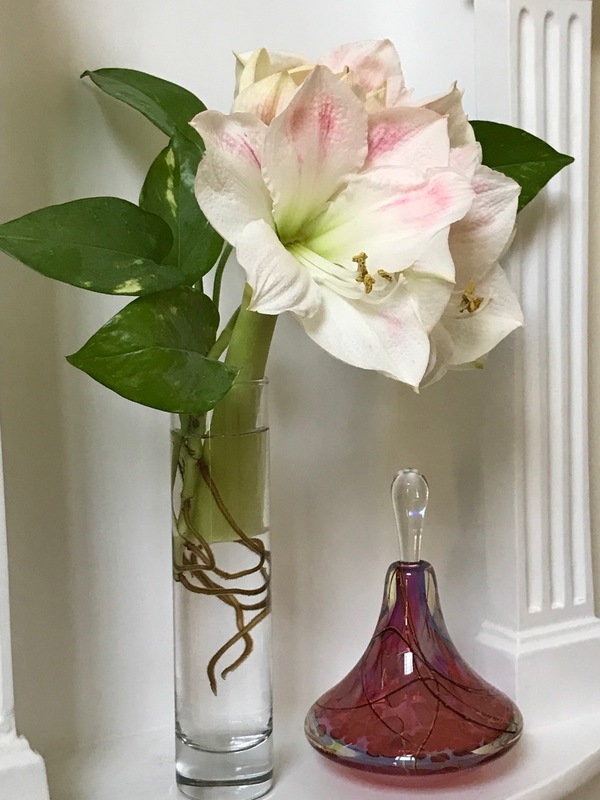 Beautiful Amaryllis and I love the roots too! Thanks Beth—bet you could find a perfect spot for that amaryllis you saw! Your arrangement is so fitting for the place you have chosen. The light is wonderful. Thanks Noelle. I was happy to find that much light—it was late afternoon. The little niche in our foyer is useful for staging. Yes, it was a perfect gift—long-lasting and beautiful. Nice! I like the touch of soft blush pink. Tried to look up the name, as my sister hadn’t recorded it. Possibly Apple Blossom.